Something I enjoy doing (let me scratch that--> something I’m OBSESSED with doing!) is waking up early on the weekends, getting some hot + delicious coffee and walking down to the beach with my two loves Guille & Papi; drinking coffee and spending quality time with mis amores really makes me appreciate living in this grand coastal city, and it definitely puts me in a better mood to start the day. 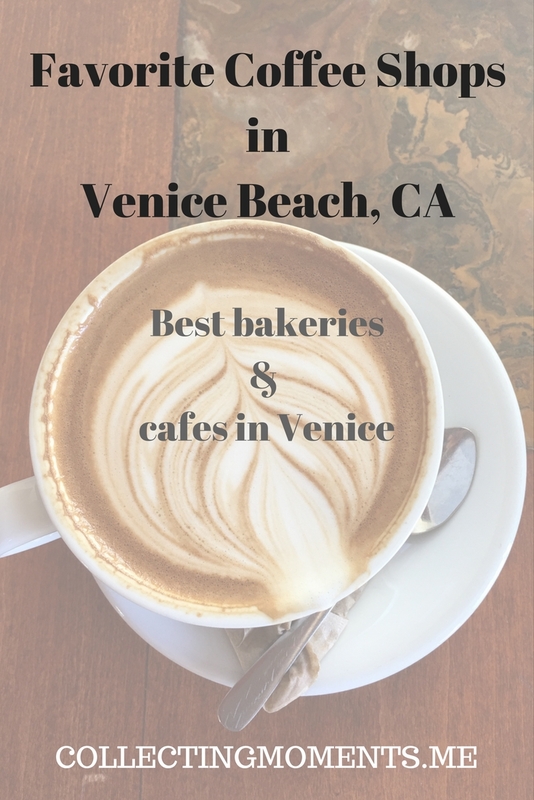 So, I’ve decided to share with y’all my favorite coffee shops in Venice Beach where I love splurging on some baked goods and yummy coffees on occasions (Yes, I also like to prepare coffee at home) before starting my marvelous morning ritual. Deus Ex-Machina – Located on the corner of Venice Blvd and Lincoln, this is by far my favorite cafe to go hang out, sip on some coffee/tea and get some work done (and you can of course order your drink to-go). It’s a very cool and hip Australian motorcycle store that sells men’s apparel and accessories that doubles as acoffee shop with a great terrace to enjoy. They also sell baked goods and some snacks if you get a bit hungry! Menotti’s Coffee Shop – This spot is perfectly located right by the Venice Beach sign and a few steps away from the beach! It’s small but with a cool vibe, décor and friendly staff. My favorite is the almond milk latte. Intelligentsia Coffeebar — This coffee shop is right on Abbot Kinney and is as hip as the street it’s located on. It has a very minimal and modern décor and ALL types of coffees! It’s a cool place to bring your laptop and get work done/study, but small, so keep this in mind and maybe visit during slow hours. Gjusta – omg, I will soon write a food review for Gjusta because its food is SO GOOD, but definitely hit it up for coffee and pastries to-go (so, so DELICIOUS). It’s located on Sunset Ave in Venice, near the busy Gold’s Gym. If it’s your first time there, there are NO SIGNS or anything with the name Gjusta, so just look for the white brick building with a huge wooden door and you’ve found it! (It has a boxing gym right next to it) It’s also good to know that Gjusta is always busy and has very limited seating! So I would say this is a perfect spot to just order everything to-go. Now, Both Rose and Superba are other bakeries that I love stopping by to order some coffee, but they’re both bakeries/restaurants. So, if they happen to be on the way for you, I definitely recommend buying some warm drinks, but if you don’t live in the Venice area, I rather you visit both of them to actually try their food which is AMAZING! Now you know where to grab some heavenly coffee + treats next time you’re in the Venice Beach area! Let me know if you know of any other shops I should try! P.S - What are some of your favorite morning rituals? Are you a morning person like me? I would love to hear some of your favorite ways to start the day! !